Winners have been picked, congrats to: Laura, Venessa, Danny, Mark, and Rob. For those of you that haven’t had the chance to read or watch my recent Metropolis Tank Review, you should definitely check it out. I personally don’t give my blessing to many tanks that have come out lately – yes, I may say they work as intended, product good vapor, may not leak, and has an overall great performance, but that doesn’t mean they land in my daily cycle. See, I’m a huge fan of the SubTank Mini and the TopTank Mini. I enjoy the perfected airflow, the coils, and simplicity of those tanks. And, that brings me to Atom Vapes’ latest offering, the Metropolis Tank. The Metro Tank was built with the same base, but offers a different design that is more pleasing. No matter what you put this tank on, your setup will look as fresh as ever! 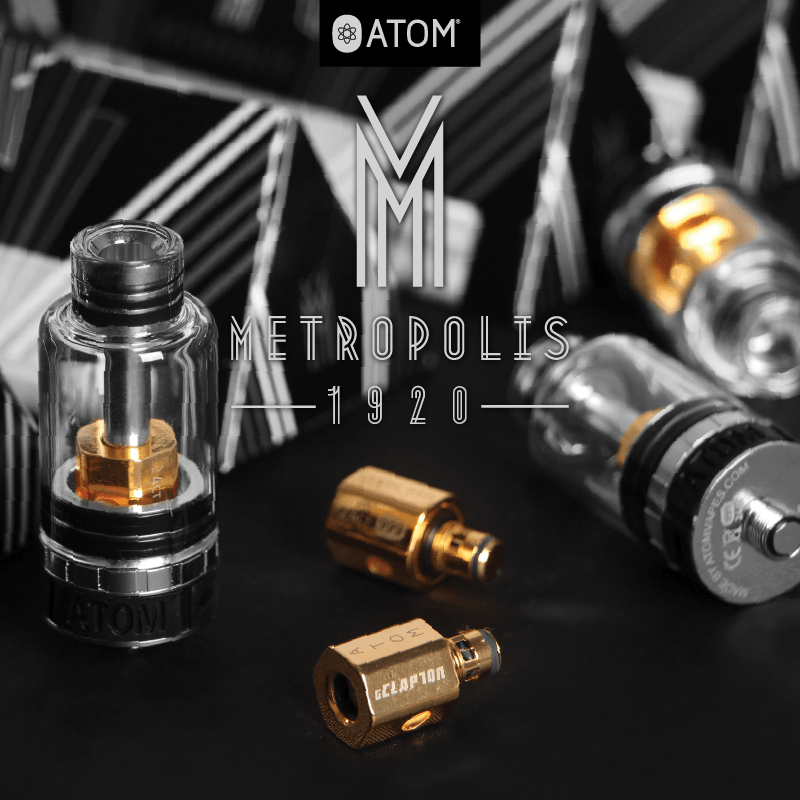 Anyhow, our friends at Atom Vapes wants to give away 5 Gold Metropolis Tanks to the Guide To Vaping viewers. Starting today, you’ll have two weeks to enter into this giveaway, share it with your friends, and if we get enough entries into the giveaway, I’ll ask Atom Vapes if they could be kind enough to giveaway more! Comment Below With Your Thoughts on The New Metropolis Tank. Show Your Appreciation To Atom Vapes By Visiting Their Website Here. Winners: 5 Winners Will be Announced July 29th, 2016. I think that the metropolis is a beautiful looking tank. And the fact that it uses all the subtank coils makes it an even better tank. Kanger has definitely produced some very nice coils this past year. I wouldn’t mind having one of these beauties to add to my collection and rotation! I need that for my new wismec 200s! This tank looks dope. Thru the glass you see the gold atomizer, which I find out is one of my favorite atomizers, made by Atom, which has Clapton wire! This is just a clean looking tank that I’m going to try. Thanks for the review! This will look great on any of my mods. I’ve been looking for something like this for awhile. I would love this tank, it the versatility of the tank has my mouth watering. It’s a great gift for my RX200. I like the understated blingyness of the Gold Metropolis Tanks. Great looking tank! Looks great, love the new design!! Crazy looking tank man. I love how the top of the tank doesn’t have a metal top and instead keeps on going with that glass. Amazing looking tank, I am really digging the style. And thanks for the chance at winning one. I am still searching for the one.